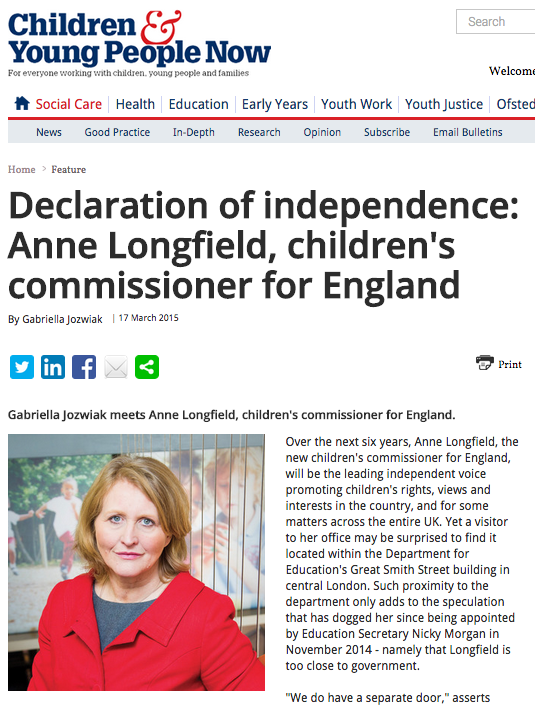 “Over the next six years, Anne Longfield, the new children's commissioner for England, will be the leading independent voice promoting children's rights, views and interests in the country, and for some matters across the entire UK. Yet a visitor to her office may be surprised to find it located within the Department for Education's Great Smith Street building in central London. Such proximity to the department only adds to the speculation that has dogged her since being appointed by Education Secretary Nicky Morgan in November 2014 - namely that Longfield is too close to government. "We do have a separate door," asserts Longfield when asked about the Office of the Children's Commissioner's (OCC) relationship with its neighbour. "We are looking for new offices and hope to be able to move later this year. It's an important symbolic issue being in a separate building." Longfield explains that the department was forced to take up the offices 18 months ago because of a shortage of accommodation and high office prices. She also insists DfE officials cannot stop by her desk without warning. "We have our own security on the door," she says. "It's not a cosy relationship that people might be worried about…"
Read the full interview at Children &Young People Now online. Thank you for highlighting such an important topic. I think people should step up and help these families as soon as they can. Gold help them.